Need More Info About Services? Select your Product below and click on ORDER NOW. This will take you to our Registration process (YOU MUST REGISTER). You MUST sign, date and return both Terms of Service Accept & Agree To Purchase Data forms located on website to black bar: Authorization Forms. You will then be taken to our Shopping Cart to pay for your product with a credit card. 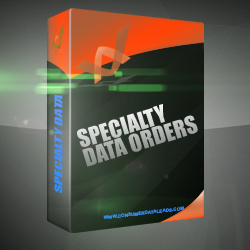 Specialty Data Orders are not readily available, we charge a $50 fee per count request to cover the time and expense incurred while researching these records. This non-refundable fee is applied to the cost of the data when you place your paid order. *Bankruptcy,Tax Liens & Judgment records are not readily available, we charge a $50 fee per count request to cover the time and expense incurred while researching bankruptcy records. This non-refundable fee is applied to the cost of the data when you place your paid order. Please specify if you want Open Filing Bankruptcies or Discharge/Dismissed Bankruptcies. Phone numbers are available through our Data Hygiene Program. We have the following available tax liens; in addition please advise if File Date or Disposition date. FEDERAL TAX LIEN-updated by the 6th of each month. *Consumer Mailing List are not readily available, we charge a $50 fee per count request to cover the time and expense incurred while researching your request. This non-refundable fee is applied to the cost of the data when you place paid order. Search Renters by city and/or zip code nationwide. Includes address, income, marital status, length of residence, phone. Easily saturate a neighborhood at the lowest postage rates possible. Reach new Renters and Homeowners with timely offers. Target just the right person for your offer. Reach all households in any geographic area at the lowest rates. Reach on-site and/or absentee homeowners nationwide. Find eager buyers settling into new homes. Phone connect. Find prospects looking for lawn care, pool maintenance, property management, etc. Increase exposure to eager, willing buyers. Currently listed their homes for sale. *Specialty Mailing List are not readily available, we charge a $50 fee per count request to cover the time and expense incurred while researching your request. This non-refundable fee is applied to the cost of the data when you place paid order. Target high school and college graduates quickly, accurately and at a low cost. Reach patients with certain ailments looking for products and services that meet their needs. Get the names and addresses of every registered voter in your geographical area. Kickstart your marketing campaigns with verified business emails. Find consumers based on the vehicles they own. Reach new businesses as soon as connectivity changes occur. Expand your reach to physicians, nurses, and dentists at their office location. Get your company name out to those interested in credit repair messages.